Platform shoes not included. Wig sold separately. As famous for their fashion as their music, the Abba Costume train is one you don't want to miss! Wearing super fashionable jumpsuit style flares like this in many of their video clips, Abba is a great choice for a retro or 70s theme party, and this catsuit style is an instantly recognisable Abba-inspired outfit perfect for any child of the seventies. 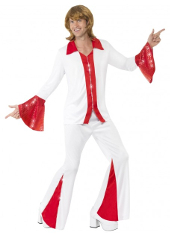 Team it with the Frida or Agnetha Super Trooper Costume for a great couple costume!